GEOFLUID 2018 - 3 to 6 October: ENTECO will attend the International Exhibition in Piacenza (IT) with important innovations to enhance foundation jobsite management. Enteco is committed to coming up with the most suitable technical solution for the challenging job site requirements of each Customer and to offering a comprehensive job site management. 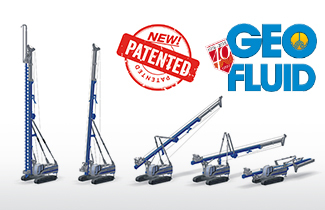 Geofluid will be a perfect opportunity to show you two complementary and multipurpose key pieces of machinery that perform well in all foundation worksites: medium size, high performance. On our Stand 1F (Outdoor Area) we will be exhibiting an E6050 rig equipped with the LM (LONG MAST) Kit, a unique ENTECO patent, which provides a considerably longer stroke of the rotary head thanks to the combined advantages of the mast extension, the pantograph system and the support of two rear hydraulically operated back-stays that ingeniously fold up for transportation (with no parts having to be disassembled). LM KIT: WATCH THE VIDEO!